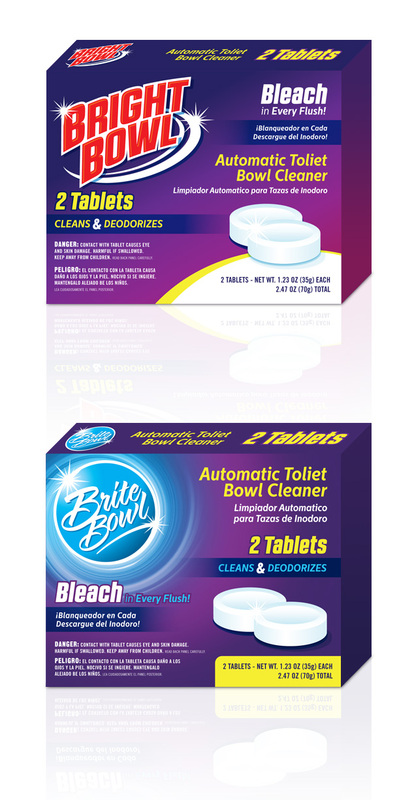 A St. Louis Metro East manufacturer of automatic toilet bowl cleaners recently contracted Visual Lure to design its new packaging. They haven’t decided on whether to use the name Bright Bowl or Brite Bowl, and they wanted to have packaging design options for both. However, once they reviewed our initial design options, they may utilize both. Of their two main competitors, one uses blue packaging and the other uses green. They wanted their product to look completely different so they didn’t want to uses either of those colors. They also wanted their product to appeal to their main target audience, women, so we decided to use the color purple. Color studies and research have shown that women like it. Below are the two packaging design options we provided. Check back soon to see if they use one design or both. If you are looking for professional packaging design, whether you’re in the St. Louis, MO area or anywhere else in the country, contact Visual Lure today.